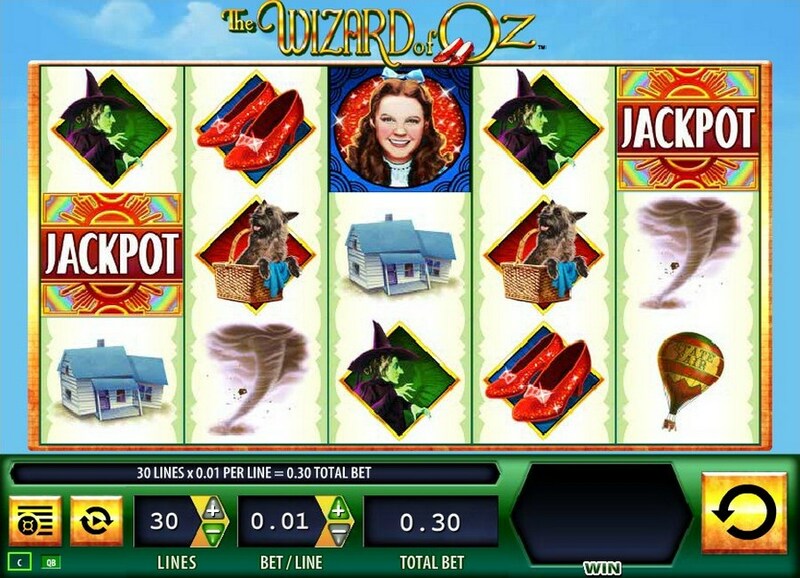 Wizard of Oz Road to Emerald City is a five-reel, 30 line video slot game by casino software developer WMS Gaming that includes Scatters, Wilds and plenty of free spins. Landing three Feature symbols of slot will trigger the Oz Pick Feature. The chosen Feature symbol can offer a cash amount or access to either the Road to Emerald City Fea­ture or Winged Monkey Feature. The Oz Pick Features awards will depend on the number of lines played. The Winged Monkey Feature will award eight free spins. Road to Emerald City Feature will award selecting emeralds. These can then award cash amounts, character land or Emerald City. Feature symbols of slot will only appear in the base game. Glinda the Good Witch will randomly appear during the base game on a reel spin and she will change up to five of the reels into expanding Wilds. The paylines will then be evaluated after the reels stop and all line wins will then be paid. 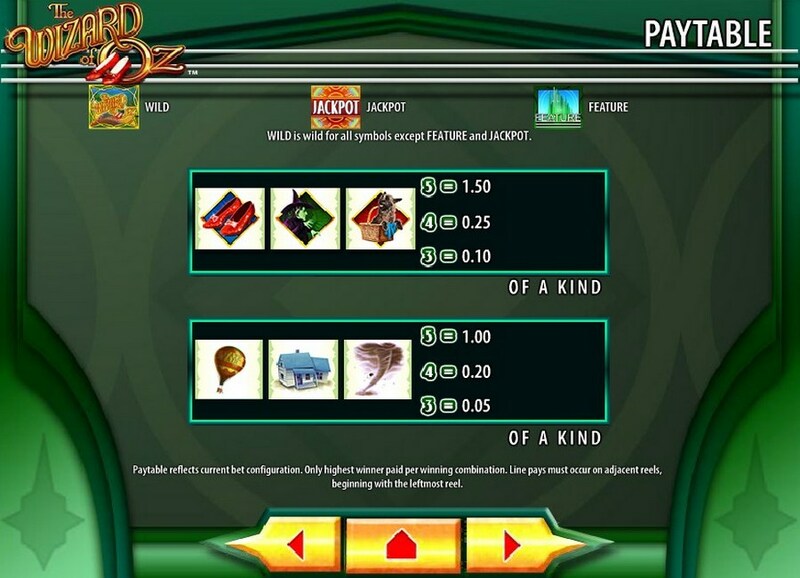 Wilds can be substituted in for all symbols other than Emerald City Feature and Jackpot symbols. Landing three Scatter symbols of slot in reels 1, 3 and 5 will trigger the Oz Pick Feature. This chosen slots symbol can then award you either a cash amount or access to the Road to Emerald City Feature or Winged Monkey Feature. This feature will award eight free spins. If the Winged Monkey symbol appears on the 3rd reel the Winged Monkey Feature will be triggered. Clicking anywhere on the screen will cause the Winged Monkeys to enter the screen as they randomly remove the reel symbols of slot and leave the Wild symbols in their place. If three Winged Monkey slots symbols appear on reels 1, 3 and 5 additional free spins will be added to the total remaining. Select an emerald from the group shown. The selected emerald can then award a cash amount or access to the character land or Emerald City. If the character land appears they are randomly sent to Scarecrow Corn Field, Tin Man Apple Orchard, Cowardly Lion Dark Forest or Wicked Witch Castle. The character land promotes to select one of the Gold Charms, which reveals either a character or a return to the Yellow Brick Road to select emeralds. 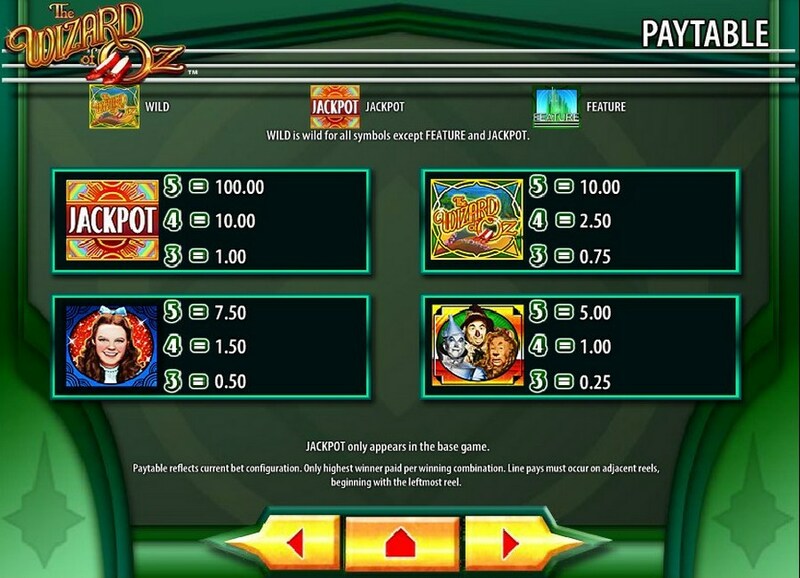 Wilds can be substituted in for any slot symbol other than Feature of Jackpot symbols. Wizard of Oz is a very fun and exciting slot machine game, one of the fine examples of the genre. After playing Wizard of Oz, you will understand once more why you love slot games. Payout amounts are nice too – you can win 50.000 coins on a single spin. Highly recommended.